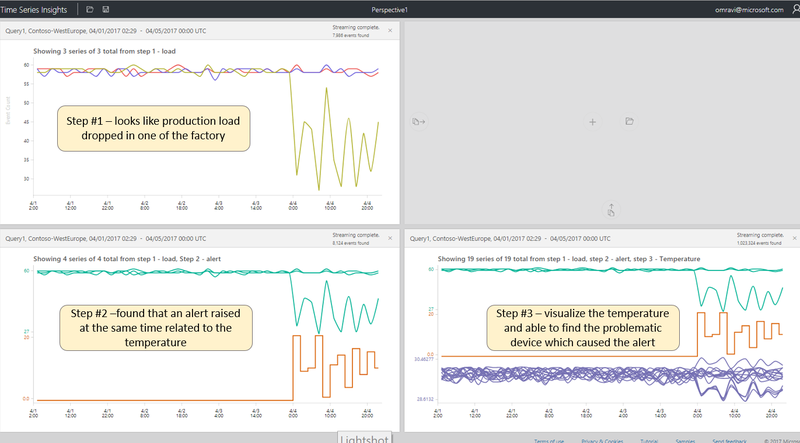 Perspective View enables analysts and engineers to efficiently perform complex tasks like multistep analysis, viewing data from multiple sites, saving checkpoints, or time-based and pattern-based data comparisons. With Azure Time Series Insights, customers have developed a new appetite to deepen their analysis by further exploiting their data. Up to now, this required home-grown workarounds that were costly and time consuming to accomplish. This post will show some common ways to harness the full power of ‘perspective view’ to easily boost the insights you get from your data in just a few steps. 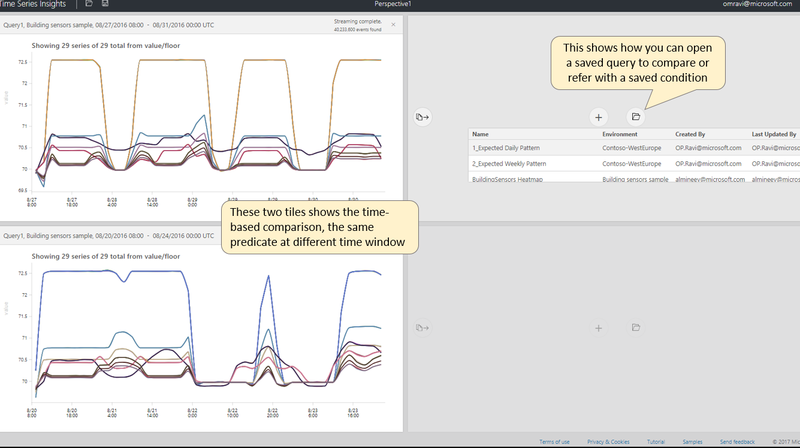 To get started with a perspective view, click on the four squares button in the top right corner, after selecting your environment in the Time Series Insights portal. Almost all data investigations and analyses involve multiple steps to find the actual answers like faulty devices, threshold values, overall impact, etc. Using perspective view to save checkpoints or intermediate steps, it’s now much easier to discover the complete story. The Time Series Insights team is religious about dogfooding our product to track and monitor the performance of our service. I constantly find myself using this feature to show the complete sequence of an investigation I’ve conducted and full story to my engineers! The best part is that I can save the perspective view so others on my team, and across the organization, can quickly see my complete investigation too. Go to “perspective view” and clone the current view. Change the current time to the required time window in the cloned view. That’s it - now you can visually compare your data. The time-based comparison is valuable, but many customers have saved queries for interesting patterns or different business conditions which are not bound to time, but are important to refer and validate expected behavior. Perspective view allows you to open a saved query and compare it with the current or required data to quickly verify the state and expedite the analysis or investigation. When you have manufacturing plants or deployments in different locations worldwide, your data is usually siloed or stuck side-by-side in a single location. It makes it extremely difficult to visualize and analyze all the data from various geo-locations in near real-time. In perspective view, you can see the data from multiple environments which makes it easy to analyze the global trends or data per plant or location. 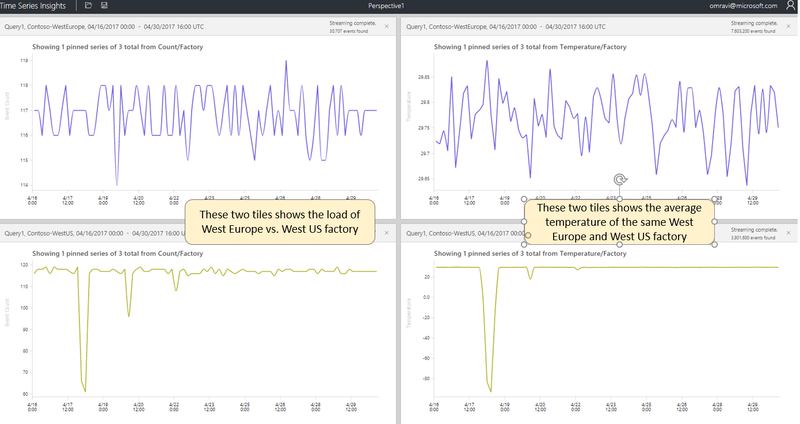 For instance, one of our customers has manufacturing plants all over the world, and before Time Series Insights, it was very difficult to observe in real-time how many parts are produced in each plant, at what rate, energy consumption, etc. By using the perspective view feature they discovered a few insightful differences between plants. They are now working to improve overall productivity by using the best practices from the highest performing plant. At the moment there is a current limit of four tiles in a perspective view. We are working to add more capabilities and are excited about what’s to come, so be on the lookout for more product news soon! 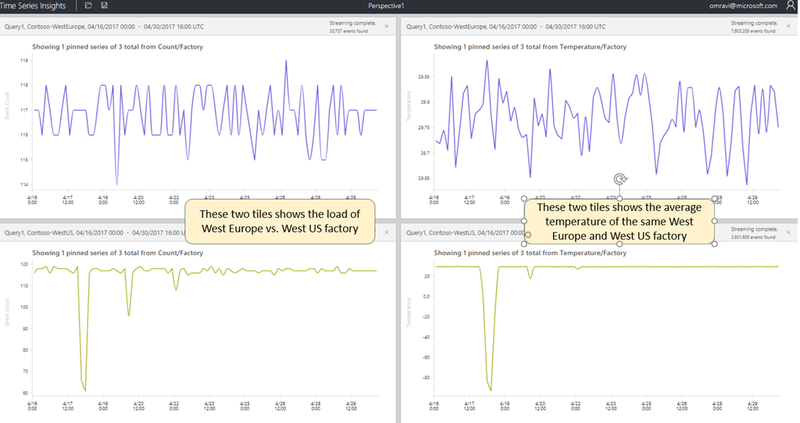 You can also explore Time Series Insights and take the recent improvements for a test drive using our free demo environment; you’ll just need an Azure.com account to get started. You can also stay up to date on all things Time Series Insights by following us on Twitter.